Welcome to the FacultyWorkshop Podcast, where faculty learn the most successful strategies used by other educators. Whether you are looking for ways to improve your teaching, productivity, or simply looking for professional development opportunities, we've got you covered. 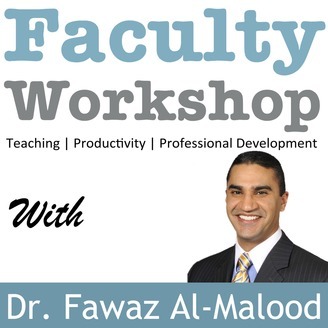 This podcast is hosted by Dr. Fawaz Al-Malood from FacultyWorkshop.com. Dr. Al-Malood shares a few unsung tips for faculty who are struggling to find time to write. This episode was based on a short essay commissioned by the Chronicle of Higher Education back in March 2017. If you are finding this podcast helpful, please share it with other faculty. I would also love for you to head on over to iTunes leave a positive review as it helps others find the podcast more easily. Hello and welcome to the FacultyWorkshop podcast, “THE" podcast for college educators. 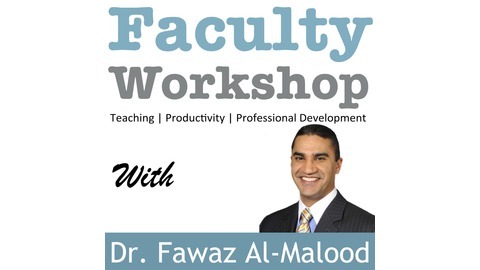 I am your host Dr. Fawaz Al-Malood with another exciting episode. In today's show we're going talk about Finding Time To Write. Before I get into the content of this episode, I wanted to share the background behind this topic. I was contacted by the Chronicle of Higher Education to write a short essay not to exceed 300 words on what I thought are a couple of good — or unsung — tips for faculty members who need help finding time to write and research. I typically write longer articles and essays, but I thought this would be a good exercise in attempting to provide some useful information in a concise soundbite. This episode is based on the essay that I wrote for the Chronicle and it will be a lot shorter than my usual episodes. So with that background story in mind, let’s just started with today’s episode! Like most faculty, I first started seriously writing while I was in graduate school. At the time, I was working full-time during the day and working on my studies in the evening. I didn’t have the luxury of dedicating huge portions of my day to writing. What I did have was an academic goal and a graduation deadline. With this realization, I utilized two techniques that worked extremely well for me. The first technique was mirco-writing during the week. I began writing whenever I could in increments of 5 to 15 minutes. I did this before going to work, during my coffee and lunch breaks, and before bed. Every spare, and sometimes odd, minute during the day counted towards my writing productivity. A sentence here and there eventually adds up to a paragraph and then a page. This meant that I took my notebook or laptop everywhere. The second thing that helped me was to be intentional about writing and making it a part of my daily routine rather than a chore. I tend to do a lot of my writing early in the morning when my family is still asleep. I typically wake up at 4am, grab breakfast and then get to my computer to begin writing. Some may prefer to write in the evening, at a coffee shop, or library. The time and location do not matter as long as writing becomes a part of your daily schedule. So start taking advantage of every spare minute and make writing a daily habit. You may be writing in sound-bites, which may feel different at first, but you will be writing and doing so regularly. Practice micro-writing. Identify pockets of 5 to 15mins during daily schedule to make incremental writing. Take a notebook, tablet or a laptop everywhere you go. Be intentional about your writing. Make it a part of your daily routine and be consistent about writing something every day.